The Dry Grass of August is Anna Jean Mayhew's debut novel on 1950s southern racism -- seen through the eyes of a thirteen-year old white girl. When thirteen-year old Jubie Watts embarks on a road trip with her mother, siblings, and the family's black maid named Mary, Jubie witnesses and experiences racism in an entirely new light as it becomes more prevalent on the drive south from North Carolina to Florida. When a terrible tragedy befalls Mary, Jubie is confronted with the rudest awakening to just how horrible and evil the world can be. The Dry Grass of August is well-written and very touching; novels on racism never fail to make my stomach turn with the powers they possess to make us realize just how ugly, corrupted and violent people can be. It's not surprising why young girls like Jubie and her siblings lose their innocence sooner than necessary when they witness the people they love being unjustly mistreated and abused. Although written from Jubie's point of view, The Dry Grass of August is not so much a coming-of-age novel as a sharp example and reminder that skin-color is irrelevant and love trumps all else. Alongside Jubie we experience her same emotions, her same heartache, and her same compassion. I really enjoyed this novel at the time I read it and finished it in a matter of hours, however found the plot strongly resembling several other novels touching on matters of southern racism. Although Jubie's voice is touching, the book is overall easily forgettable. 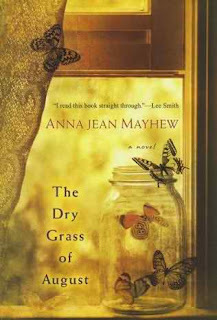 If you liked The Dry Grass of August , you would also enjoy Catfish Alley by Lynne Bryant, Sweet Jiminy by Kristin Gore, Crooked Letter, Crooked Letter by Tom Franklin, and the classics of Beloved by Toni Morrison and The Color Purple by Alice Walker.